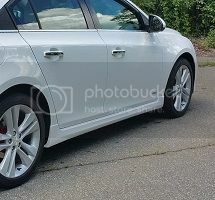 This is a discussion onVIP Cruze Build within the Chevy Cruze Exterior Modifications forums, part of the Chevy Cruze Modifications Forum | Cruze Forumz category! Hello Cruze owners! I'm Chantal, and I wanted to share my Cruze with you all! It is a VIP build and a SEMA car as well. The modifications have been funded by me, even though I have sponsors. I have a FB page for it, and IG, so subscribe to both! I post updated on both often enough. After SEMA ( November), I will post more updated photos. I can't release the vehicle at it's current state prior, but I can supply with some as it currently is. I'd love for you guys to check it out and supply me with some feedback. Feel free to ask questions and comment (be polite please). Anyways, hope you guys enjoy the pictures, and let me know if I can help other builders too!